I am a big city man. Since a boy I bought into the idea (not suspecting where it came from) of the rosy but historical idea of the citizens of Athens living the city life. Part of living that idea is to read your daily newspaper. Most of my contemporaries and even some have previously had high jobs at the Vancouver Sun brag to me that they cannot abide by the present incarnation of the daily. They don’t read it. I do. While I am fairly adept a cruising the internet and being able to find anything I want to find, I think that going through a hard copy daily (be it my NY Times which is daily delivered, or the Vancouver Sun) and systematically absorbing what’s on every page even if I may not be interested in the homes section or the business section is important. A daily makes my knowledge of my city (Vancouver) a relevant one. It is sad to find out that our Vancouver Courier will be only publishing one weekly edition by the end of this month. I remember with glee when the Courier broke the story (a prime example of stellar investigative reporting) and out scooped (does anybody under 30 understand the term?) of a manse on the West Side that was a most unreligious bawdy house! A case that proves my point is the little column in today’s Sun (in the sports section) by Greg Douglas aka Doctor Sport. I know that if I place the link here that the Vancouver Sun will in a few months dispense with it. All that, further erodes on the very nature of the essay which is about our short memory. 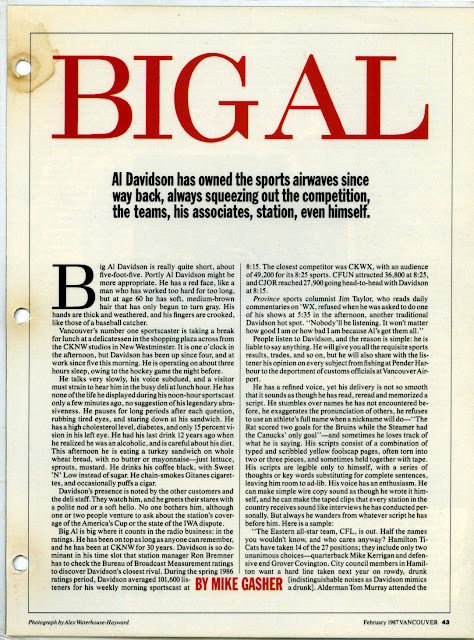 So I will put here the essay (the section on broadcaster Al Davidson and keep my fingers crossed that the Sun will not send their lawyers after me) in the hopes that my blog will be accessible for a longer period that the Sun’s short lived hyperlinks. 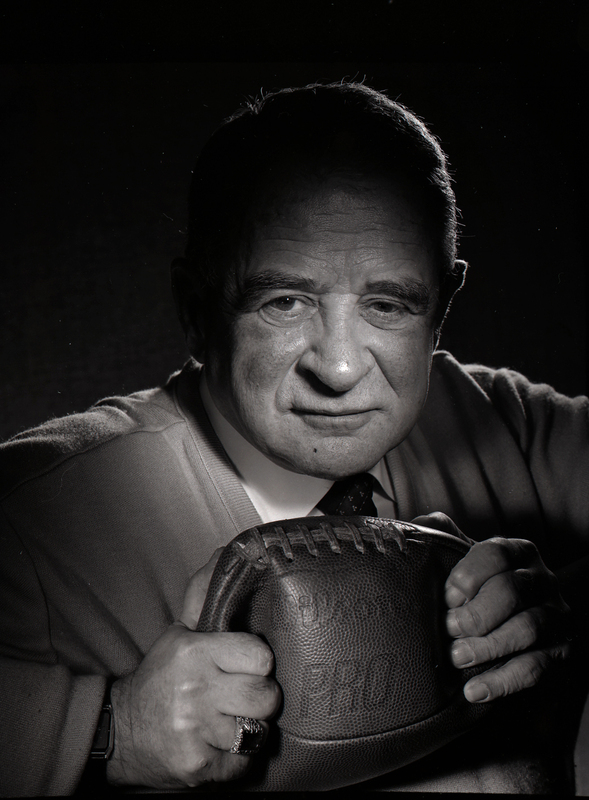 The piece mentions Jim Taylor. Some will also have forgotten who he was. I wrote about him here. In this day and age of short memory it is pleasant for me to point out that I listen to CBC’s Panamerican Games radio alerts in the hopes (most of the time it happens! ) of listening to Steve Armitage. Greg Douglas’s essay (below) mentions golden-voiced Lyndon Grove as the man who is editing the Davidson biography being written by Michael Sporer. Grove is 82 and in his head he has some of the best memories about this city which I am happy to report is my city. Kudos to Greg Douglas and the Vancouver Sun for constantly surprising me with good stuff. My photograph of Davidson appeared February 1987in Vancouver Magazine with an essay by Mike Gasher (see below) . Harvey Southam lent me the disinflated football. 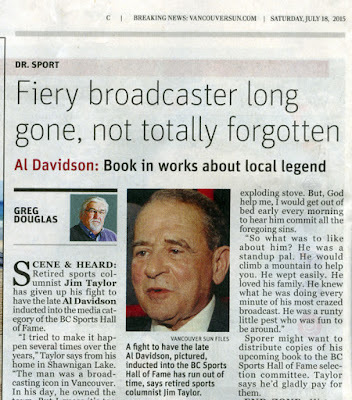 VANCOUVER — Retired sports columnist Jim Taylor has given up his fight to have the late Al Davidson inducted into the media category of the BC Sports Hall of Fame. Over the past two years New Westminster lawyer Michael Sporer has been researching and writing a book about the life and times of Davidson that will be published in 2016 to coincide with what would have been his 90th birthday and 25 years since his passing in August 1991. Revered broadcasting journalist Lyndon Grove has been working with Sporer as an editor and consultant. The Davidson story goes back to his war years in the RCAF 438 Wildcat Squadron and chronicles his radio career that included stops with CKPR in Port Arthur, Ont., CKCK in Regina and CKY in Winnipeg before arriving at CKNW in 1958. During his tumultuous career at ’NW, he was acquitted of arson charges that were laid after fire damaged the station’s boat Seawatch and he later won a wrongful dismissal suit for threatening the life of sportscaster Neil Macrae, whom Davidson had hired. Vancouver Sun columnist Denny Boyd once wrote: “I hated the infuriating way Davidson practised his trade. He was biased, bigoted, vindictive and inaccurate. Put him in front of a microphone and he became as unpredictably dangerous as an exploding stove. But, God help me, I would get out of bed early every morning to hear him commit all the foregoing sins. Sporer might want to distribute copies of his upcoming book to the BC Sports Hall of Fame selection committee. Taylor says he’d gladly pay for them. With Perfect Diction He Said, "I am dying." A Tortilla Is Not Always A Tortilla.